We are proud to announce our endorsements in the 2018 Maryland election. Clean Water Action endorses candidates based on legislative track record as well as questionnaires and interviews. In Maryland, we are focusing on competitive state races where Clean Water can make a difference to protect pro-environmental incumbents and support pro-environmental challengers. For example, rapidly developing Frederick County has been a hotbed of conservation and water quality issues in recent years and we have prioritized the overlapping state and county elections. County Executive: Jan Gardner has a proven track record in policy as an environmental steward. Notably, she has tried to restore Frederick County’s Forest Resource Ordinance to its original, better-than-minimum standard. She has sought to mitigate some of the lopsided developer agreements put in place by the previous Frederick County Commissioners. At Large County Council: Kai Hagen and Susan Reeder Jessee. Kai Hagen is a Clean Water alumnus who has been active in Frederick County for years, serving on numerous boards and commissions and providing an excellent voice for sustainable policy and the environment. Kai has previously served on the Board of County Commissioners, before Frederick County moved to its current form of government. District 1 County Council: Jerry Donald has been a champion for clean water issues on the Frederick County Council. On a county council where it has been very difficult to pass environmental legislation, Jerry successfully passed legislation to restore some of the stream buffer protections the previous Board of County Commissioners eliminated. District 3 County Council: M.C. Keegan-Ayer is willing and able to undertake detailed stakeholder negotiations on legislation to craft compromise that strengthens environmental protections when possible. District 4 County Council: Jessica Fitzwater is an asset on the Frederick County Council and a strong supporter for environmental protections. She worked with her counterparts, Jerry and M.C., to support legislation on solar facilities and stream buffers. Ron Young, the incumbent State Senator for District 3, is a champion for the environment in Annapolis. He has recently sponsored many Clean Water Action priorities, including an updated and improved Forest Conservation Act and legislation on mercury switches and relays. He is an advocate for Smart Growth — developing where it makes sense and preserving our prime agricultural and natural lands. Ken Kerr, a challenger running in District 3B, has been active in public service in Frederick County, serving on the Frederick County Board of Elections, the Frederick County Parks and Recreation Commission, and teaching at Frederick Community College. One of the initiatives he would like to expand micro-farming, especially around schools, where students could learn about climate, weather, and ecology in the context of the food they eat. Sarah Elfreth, running for Senate in District 30, has a history in environmental conservation. She was the Director of Government Affairs for the National Aquarium and will come to the General Assembly with the knowledge and background needed to hit the ground running both on policy but also the nuances and technical workings of the state budget. Pam Beidle, a current delegate running for the vacated District 32 Senate seat, has been a longtime champion on the General Assembly. She has served as the chair of the Transportation subcommittee on the Environment and Transportation Committee where she has crafted legislation that works for Maryland. Sandy Bartlett, running for delegate in District 32, will be a good successor to Delegate Beidle. While self-described as no expert in the field of environmental studies, Sandy’s own foray into square foot gardens have become a part of her neighborhood fabric, demonstrating how some household waste can be diverted into sustainable gardening. Baltimore Fair Elections: We are excited to support Yes for H, a ballot initiative to change to the Baltimore City Charter to enable the creation of a Fair Elections Fund. Fair Elections programs enable candidates to run more grassroots campaigns by encouraging small-donor donations and providing matching funds for candidates who opt in. Candidates using the program have to abide by stricter rules, such as not taking money from corporations, unions, or PACs. Our team worked on a similar campaign in Howard County, first on the ballot initiative and then to pass the enabling legislation. We will be excited to see the first batch of candidates be able to use the fund to campaign in 2022. Montgomery County’s program is active for the first time in the 2018 election, spurring a wealth of new, grassroots candidates running competitive campaigns. Polluted stormwater runoff is one of the biggest sources of pollution to local waters and Chesapeake Bay. When rain lands on impervious surfaces like roofs, roads, and parking lots and can’t soak into the ground, it runs off to storm drains and carries with it trash, sediment, and chemical pollutants. Polluted runoff is also a cause of local flooding and high volumes of flow that ruin stream channels. The bad news is that every piece of untreated impervious surface is part of the problem, but that means that everyone can get involved to fix the problem! County governments are working hard on plans to treat large areas of impervious surface as part of their Chesapeake Bay cleanup commitments, but for the most part treatment of residential properties is left up to individual homeowners who may want to do something, but may not know how. In partnership with Chesapeake Bay Trust, Howard County’s Clean Water Howard program has created a grant program to support innovative solutions to polluted runoff problems. Clean Water Action had previously piloted a door-to-door residential stormwater outreach program using our field canvass in Prince George’s County. 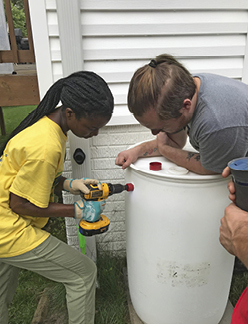 We were thrilled when Howard EcoWorks, a local non-profit that employs local youth to install stormwater projects, wanted to partner with us to install rain barrels in an impaired watershed. We are now working together on a new residential outreach program in the Red Hill Branch subwatershed in Howard County (between Columbia and Ellicott City). Red Hill Branch is a tributary of the Little Patuxent River and has been targeted by the state and county for restoration due to its impairments. For this program, Clean Water Action’s field canvass is going door-to-door to talk to homeowners about polluted runoff and signing up residents to become part of the solution. In exchange for signing a commitment to be part of the polluted runoff solution, program participants receive a free rain barrel that is installed by Howard EcoWorks’ team. The goal is to raise awareness of polluted runoff problems and change resident’s behaviors so they are reducing stormwater runoff from their own properties. Taken together, the actions of Red Hill Branch residents can add up to big reductions in polluted runoff! 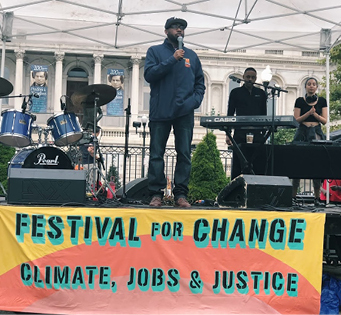 On Saturday, September 8, thousands of Rise for Climate mobilizations demanded action and accountability on climate change, job development, and justice from local governments all across the world. But in Baltimore, the “Festival for Change: Climate, Jobs, and Justice” was only the latest in a long series of Baltimore Peoples Climate Movement mobilizations, aimed at building a powerful climate movement in the city that connects the dots between climate justice and other issues of injustice that impact Baltimore residents every day. We know that one impact of climate change on the mid-Atlantic is more extreme weather — and we’re seeing that this year, as Baltimore has experienced the wettest March-to-July period on record. This Saturday was no different, as rains drenched the Festival for Change and cut the speaking and music program short. But the festival was resilient and stayed open even in the rain, enjoying a unique blend of arts, educational information, and opportunities to engage in local climate campaigns. This has been an exciting summer for Maryland regulatory announcements, with some good and some bad. Two good announcements came out of the Maryland Department of the Environment, where new permits are requiring that facilities reduce their pollution to our water and air. Unfortunately, out of the Department of Agriculture, the implementation regulations for the Keep Antibiotics Effective Act are so weak as to effectively kill the law. Effluent Limitation Guidelines (ELG): Last summer, the Maryland Department of the Environment (MDE) was in the process of updating the discharge permits for three coal fired power plants in Maryland. We, and other environmental groups, mobilized to ask Governor Hogan to impose limits on the toxic metals these plants discharge into our rivers. Late this summer, MDE released its new permits and is requiring that the plants meet the new federal limits on toxic metals in wastewater. To Clean Water members who follow our national work, this may sound familiar. These ELG standards are one of the many environmental protections that President Trump’s EPA is trying to roll back. Even when the federal government stumbles, states can and will impose the standards to protect their people and their environment. Air Pollution Limits for BRESCO: BRESCO is a trash incinerator in Baltimore City that burns municipal waste from the city, county, and contractors across the region. It is an aging facility with inadequate pollution controls, although it is touted as waste-to-energy and “green.” BRESCO generates more emissions of nitrogen oxides per unit of energy than any other power plant in Maryland. Nitrogen oxides (NOx for short) can contribute to asthma, cardiovascular disease, and other health concerns. The recent draft permit the Maryland Department of the Environment released reduces the amount of nitrogen oxides that BRESCO can emit by 200 tons per year, which is great. It also requires that the company that owns BRESCO submit a study evaluating its options for reducing NOx emissions more, such as by installing state-of-the-art pollution controls. At that point, MDE says it will write new, stricter regulations. Our problem here is that Wheelabrator, the company that owns BRESCO, has every incentive to avoid a standard that will require them to install new pollution control technology at the incinerator. We need to make sure that MDE requires that they conduct a real and rigorous study of the facility’s options — and that the state follows through will more aggressive limits. Keep Antibiotics Effective: In 2017, the Maryland General Assembly passed the Keep Antibiotics Effective Act, which was designed to prevent the overuse of antibiotics no farms. This legislation was the result of countless hours negotiating with many stakeholders to make sure that the legislation considered the important uses of antibiotics on farms with the growing health crisis of antibiotic resistance. The legislation passed through with a veto proof majority, and Governor Hogan allowed the bill to become law without his signature. This summer, the Maryland Department of Agriculture released its draft regulations to comment and we were surprised to see that the legislation did not address the problem. The proposed regulations are so weak that we are concerned that the overuse of medically important antibiotics on Maryland farms will continue. Antibiotic resistance is growing, and health groups around the globe agree that the use of antibiotics for disease prevention in meat production is a big contributor to the problem. We will continue to push back on these regulations. In the beginning of September, we, along with our health, animal welfare, and environmental allies, delivered 1000 public comments to both the Department of Agriculture and Governor Hogan asking them to uphold the spirit of the law and do better. Clean Water Action is a proud member of the Baltimore Housing Roundtable, a coalition that works to build a vibrant non-speculative, permanently-affordable housing sector in Baltimore. This summer, after years of deep organizing, the Roundtable secured a key victory when the Mayor and City Council members pledged to allocate $20 million yearly to the Affordable Housing Trust Fund, to be made available to local organizations to protect affordable housing in Baltimore. The Roundtable hopes that these funds will make it possible for residents of neighborhoods with high rates of vacancy or facing gentrification to gain control of development in their own neighborhoods — removing sources of lead contamination, mold and mildew, and other threats to public health while creating denser, more walkable neighborhoods. District 8 can count on Representative Don Beyer. His continued commitment to pushing back against the dirty water agenda and prioritizing action on climate, defending safeguards makes him someone we can’t do without. We know that he will continue to represent your priorities and will keep working against the polluter-powered policies that will put our health and water at risk. That’s why we’re asking you to stick with Don. District 10 is one of the most important races in the country. It will help determine who will control congress — polluter cronies or people who will put your needs first. Clean Water has been canvassing and organizing grassroots campaigns in the district for a number of years in an effort to help elect a leader who will stand with us. We need leaders who will defend vital safeguards for clean water and public health, while taking action to fight climate change. That’s why we’ve endorsed Jennifer Wexton. Jennifer is a fighter and the best candidate for the 10th. Her environmental priorities in Congress will include increasing the affordability and accessibility of clean energy, investing in clean energy technology and jobs, protecting Virginia’s coast from offshore drilling. District 11 is represented by Gerry Connolly, a tireless champion for clean water and our health. As a co-Chairman of the House Sustainable Energy and Environment Caucus, Gerry has led the push for investments in clean energy – helping pass the largest investment in clean energy in American history and supporting legislation to reduce global carbon emissions. Gerry’s advocacy on behalf of the Chesapeake Bay and his constituents means he knows how to fight for clean water. That’s why we’ve endorsed him time after time. He is with us and we know we can count on him. De-icing salts applied prior to and during winter storm events in urban and sub-urban areas increase the amount of chlorides in the environment. 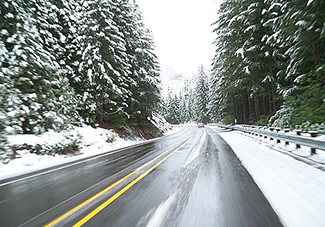 Salts are applied for the important purpose of maintaining public safety during winter storm events; however, the components are subsequently washed off into local waterways or seep through soils into groundwater systems with numerous negative impacts. On top of that, road salts are entering these bodies of water in a fashion that causes salt levels in streams to remain elevated year-round. The salts can contaminate drinking water resources and are often cost prohibitive to remove. Salts can wreak havoc on local plants and animals. The application of salts impacts infrastructure, vehicles and other property. Due to their corrosive nature, salts increase the costs of maintenance, repair, and replacement of infrastructure like roads, sidewalks, driveways, bridges, and pipes. Water supply, wastewater, and stormwater systems have to address pipe corrosion by high cost repair or replacement of conveyance pipes. In addition to corrosion, water suppliers may face other challenges due to increased salt content in the source water. Improved management of the use of salts has the potential to balance the dual goals of public safety and minimizing the negative impacts of salty runoff to the natural and built environments. The use of alternatives when applying these products can decrease the amount of de-icing salt used, thus reducing costs and environmental impacts all while maintaining the public’s expected level of service. This summer, Clean Water began working with the Virginia Department of Environmental Quality (DEQ) in the development of the Salt Management Strategy (SaMS) in the Northern Virginia region. The SaMS aims to prepare a strategy that is capable of achieving the target chloride (salt) loads identified in the Accotink Creek Total Maximum Daily Loads (TMDLs) and that proactively addresses salt application in the broader surrounding regions. The SaMS intends to accomplish this while fostering collaboration among all stakeholder groups involved or impacted by snow and ice management to encourage long-term support for improved practices that protect public safety and lessen environmental, infrastructure and public health effects. As a member of the Stakeholder Advisory Committee for the SaMS, Clean Water will develop a suite of improved winter use practices and recommended actions for Homeowner Associations (HOA) and homeowners, and generate long-term public support for improved water quality in the Northern Virginia region through implementation of community Best Management Practices (BMPs) that reduce chloride loads in runoff within the Accotink Creek Watershed and Potomac River Watershed. On August 2 and 3, the Anacostia Park and Community Collaborative (APACC) participated in a two-day training organized by the Chesapeake Bay Funders Network and Movement NetLab (MNL). The training was designed for networks receiving funding and other support under the Capacity Building Initiative (CBI) to meet, synthesize who we are in our work, share information, and think about proactive collaboration. Race, class, and equity as well as ways that socialization and conditioning transform how we see the world were central to the training. CBI is a three year, comprehensive program of the Chesapeake Bay Funders Network that provides support to watershed organizations and allied stakeholders through grants, one-on-one training, networking, and tailored technical assistance to increase the operational effectiveness of these organizations. Practically, what this means is that the regional networks are made up of diverse conservation and civic organizations working to improve local environmental and community health conditions in priority landscapes. MNL is a practice-centered “think-make-and-do-tank” that was founded in 2014 after both Occupy Wall Street and Occupy Sandy proved that decentralized network structures could accomplish big things on a massive scale. The organization is comprised of movement-based activists, organizers, and researchers seeking to better understand decentralized self-organizing structures with the goal of developing powerful conceptual and practical tools that help facilitate the growth and effectiveness of the most dynamic emerging social movements of our time. MNL conducted an assessment of all the networks, including APACC. The goal of the assessment was to give us a baseline on the current state of our network and help us determine how developed our network is, and what we can tweak in the network that would make it more effective. APACC will incorporate lessons learned from the training and network assessment, including refining our organizational shape, decision-making structure, public-facing communications, and membership policy. Will there be individuals as members? APACC has recently been exploring an “individual membership” policy and recommended guidelines so that interested community residents can become directly involved in the collaborative. As part of that effort, the network’s communication and policy sub-work groups have begun developing a public facing online communications program in an effort to build our capacity to publish original content that is both meaningful to Wards 7 and 8 residents, and relevant to the network’s vision and goals. As we approach 2019, we are continuing to work towards the shared objective of achieving socially, environmentally, economically vibrant civic spaces along a clean river adjacent to healthy, sustainable, diverse, and exemplary communities, and diversifying and increasing participation of organizations and residents who have not traditionally been involved in the overlap of water quality, neighborhood development and green space.